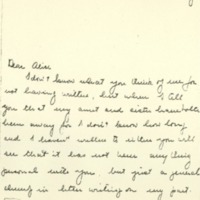 Jessie writes to her friend Alice about life at Princeton. I don't know what you think of me for not having written, but when I tell you that my aunt and sister have both been away for I don't know how long and I haven't written to either you will see that it has not been anything personal with you, but just a general slump in letter writing on my part. Oh Alice, I haven't seen the spring in the country for five years and it is perfect bliss to be here. I never knew spring was so lovely, and every spare moment that I have I wander lazily in the garden or sit and just gaze up into the trees. All work is neglected to sit entranced and listen to the birds and see the wee bits of buds, and find out what new flowers have come up in the garden. How you people, in beautiful Wellesley, with that lake and all, can possibly study is beyond me to guess. I am thankful that Baltimore was in an ugly old city, otherwise I should never have graduated.Katharine Scranton spent the Easter vacation with me and Marian part of them. We had the very best of times. Princeton wasn't closed and there were all kinds of concerts, plays, lectures, and dances and dinner parties. Princeton has seldom been so gay. Katharine will leave with a distorted view of it. She intended to do some studying, went so far as to get a book from the library, but never did a bit of work. In the mornings we played ball in the garden or just walked or lazily mooned the time away. And talked of course all the college news. Just think of their going way out to Korea this summer. I suppose I shall never see them again. I declare one almost wishes one didn't make friends if they have to be so frightfully far distant. Then I saw Frances Taft and fell full in love with her. She told me all about her situation at Wellesley—at least as much as she could with other people around and interrupting. I wish I could hear about it from you. She seemed to be quite resigned to the way things were and to believe that God had some better plan for you all than yours, and that in the end it would all be for the best. It seems hard though, doesn't it, to graduate and leave with your cherished plan uncompleted but like David I suppose you must be reconciled to your successor's carrying it on. Have you any hope that you will ultimately get affiliation?I saw Miss Condé just before she went to Wellesley. She was of course very interested in everything there and my thoughts and prayers were with you, dear Alice, all through that time. I did not know before that Princeton was unaffiliated, but I believe it is and I was so surprised to read about a month ago in the Princetonian, a notice of the journey of a volunteer band. With all the missionaries that we have had, it seems we have never before had a band. Doesn't it seem strange for a large and progressive college to be so behind hand. I suppose you have read of the death of two or our missionaries. One was killed in Adana by the Turkish revolutionaries, an '03 man, who had just married a Bryn Mawr girl, Mary C, and sailed last year. The other, Baskerville, '07, was killed making a sortie from besieged Tabriz. Princeton has quite a list of martyrs. These were here so recently and are so well remembered that it seems sadder. Baskerville has a brother here in the Princeton Seminary. My work in Trenton is going gaily on, though with the fine weather the attendance on my Bible class is sadly deteriorating. Besides the Lady in Charge or Preceptress as they call her, whose word is law, is very much opposed to the girls staying in in the afternoons. Her opposition is a very serious thing. Of course if I could spend the night there I would but as I can't,— there is no place for me to stay,—I must hold the class in the afternoons, Miss Kingman to the contrary notwithstanding. The girls are working hard for Silver Bay, selling candy and arranging a lawn fête. They generally send about three girls and that means getting about $60.00, a large sum for a poverty stricken normal school. The girls are really very poor, most h of them have come at a great sacrifice to their people at home and I really almost hate to wring money from them even for Silver Bay. However most of them buy candy every time they go down town and why shouldn't Silver Bay have the benefit of their foolish extravagance. My little mission study class in the church has been very interesting. This last month an epidemic of mumps almost broke it up, only one girl remaining unquarantined. But almost my most interesting hour was with her alone. The girls sew for a little coloured school down south which I teach and we really accomplish some sewing if we don't succeed in learning much. The class is held in the primary room and you should see us doubling ourselves up to fit the foot high chairs of the little kids. My great trouble is that I can't ask them to prepare anything outside and so of course they don't learn nearly as much as they might. But being thoughtful intelligent girls they do some thinking for themselves and that is a comfort. I have been going to the Princeton chapel and hearing splendid men, Lyman Abbott and Dean Robbins and others—I simply cannot go often to our own church for the baby food we get there leaves me in no spirit for worship the rest of the service or the day. I am afraid that our Sundays are not as a rule very devotional. The men drop in in the afternoons and we really can't prevent it, they have little enough of home life, poor things. But its distracting for us. However, this is Sunday now, before church. (I began it last night) and this little talk with you about my work, knowing that you are interested and will remember me and it in prayer is a great comfort. Please give my love to Anna Brown and remember me to all the others I met in that lovely week with you. Sayre, Jessie Woodrow Wilson, 1887-1933, “Jessie Woodrow Wilson Sayre to Alice Appenzeller,” 1909 April 25, WWP17448, Jessie Wilson Sayre Correspondence, Woodrow Wilson Presidential Library & Museum, Staunton, Virginia.